We breed and raise Large Black and Berkshire pigs. We are interested in raising rare breeds, such as these, for their excellent flavour and succulence, and helping preserve these heritage breeds for the future. 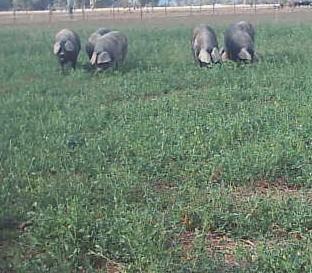 Our pigs free range and live as nature intended, unrestricted to play, sleep, graze and wallow. We believe that happy, healthy pigs provide the tastiest and healthiest meat for our table. We believe in respecting our animals from paddock to plate. Our pigs' welfare, and the end product, delicious, succulent pork, are our primary focus.